The Northern England Salesforce User Group was held at the Co-op Insurance Digital Innovation Lab in Manchester on October 9. Thanks to User Group Leader Phil Walton of Cloud Galacticos for organising the event, and thanks to Mike Mallia of Co-op’s Digital Innovation for the venue. The event was sponsored by Paul Harvie of Income Systems, so thanks for the beer, wine and pizza! Matt Metcalfe, BBraun, ‘Flowtap: enhancing the Sales pipeline with AI’. 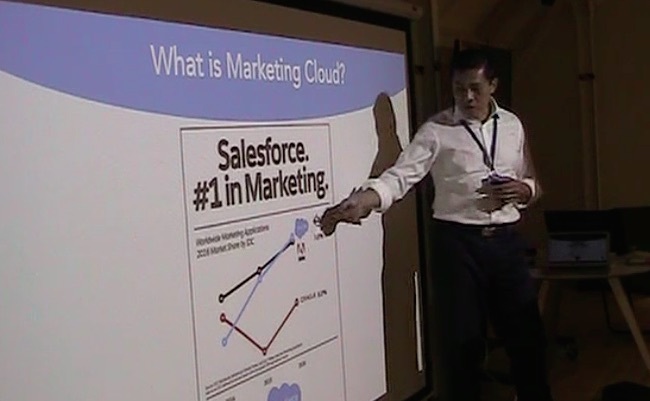 and myself, and spoke on ‘Implementing Salesforce Marketing Cloud: 10 Things You Need to Know’. To many users, Salesforce Marketing Cloud is a “black box”. So, in my talk (limited to 30 minutes), I discuss the top 10 things you need to know, from your very first SPARK or IGNITE sessions, pricing considerations, the dream of the Single Customer View, and down to Implementation Tips and Tricks. Interested in buying Salesforce Marketing Cloud?